Huawei Technologies is bringing its own "software-defined networking" switch globally in a bid to raise its profile and expand in a market dominated by Cisco. The Chinese company unveiled Thursday its S12700 Agile switch series, calling it a next generation product designed for managing campus networks. It joins the industry trend toward software-defined networking (SDN), an emerging technology that aims to deliver programmable interfaces to network hardware. With SDN, a company can better customize its campus network through software and application development, rather than rely on making manual changes to the hardware, or buying new equipment to upgrade the network, Huawei executives said on Thursday. The rise of cloud computing and BYOD (bring-your-own-device) at offices demands that vendors come up with better and more secure solutions to manage networks, they added. 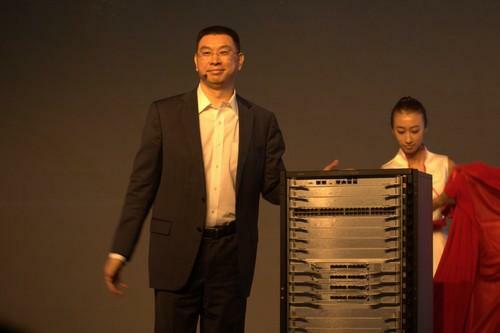 "The Agile switch and network products we launched today can truly resolve the problems customers have in network development," said William Xu, CEO of Huawei's enterprise business group in an interview. "It's a revolutionary product." Huawei's Agile switch is designed with its own Ethernet network processor that can handle different software tasks. The company claims its product will offer better performance over rival switches built with application-specific integrated circuit (ASIC) chips, but at a still affordable low price. The S12700 Agile switch series will come in two models and will arrive globally in October. Huawei is best known for supplying telecommunication equipment to carriers, but in early 2011 the company officially entered the enterprise market. Since then the company has released new server and storage products, and seen its sales from its enterprise business grow to US$1.9 billion in 2012. The company plans to hire an additional 1,000 employees globally to add to its 20,000 staff devoted to the enterprise business. By 2017, Huawei wants its enterprise revenue to reach over US$10 billion. Huawei hopes its newest product, the Agile switch series, will further pave the way for its enterprise business and become a flagship product, Xu said. Starting on Thursday, the company is starting a global campaign to promote the switch in countries such as Japan and the U.S. The Chinese company will have to contend with Cisco, a major U.S. provider of network switches. So far about half of Huawei's enterprise sales have come from its home market, with the remainder coming from foreign markets, including the U.S., where it has sold storage, switch and router products. "We have just entered the U.S. enterprise business, and we are still in the process of learning," he said. But Xu expects the company's Agile switch will also garner customers in the U.S.
Last year, Huawei's telecommunication business, however, ran into U.S. security concerns brought up by a congressional panel. The lawmakers later warned U.S. companies to think twice about buying Huawei's telecommunication gear. Huawei claimed that the U.S. government is unfairly taking a "protectionist" stance against the Chinese company, and maintains all its products are secure. The company will have to step up its marketing to grab the attention of customers, said Matthias Machowinski, an analyst with research firm Infonetics. But the company is "is pouring a lot of money into R&D, which many competitors have a hard time matching," he said. "Certainly the bulk of their business still comes from China, but they've also seen good growth elsewhere, in particular eastern Europe, the Middle East, Africa, and Latin America," Machowinski said. By focusing on emerging markets, which are growing faster than North America and Western Europe, Huawei can gain market share, he added.